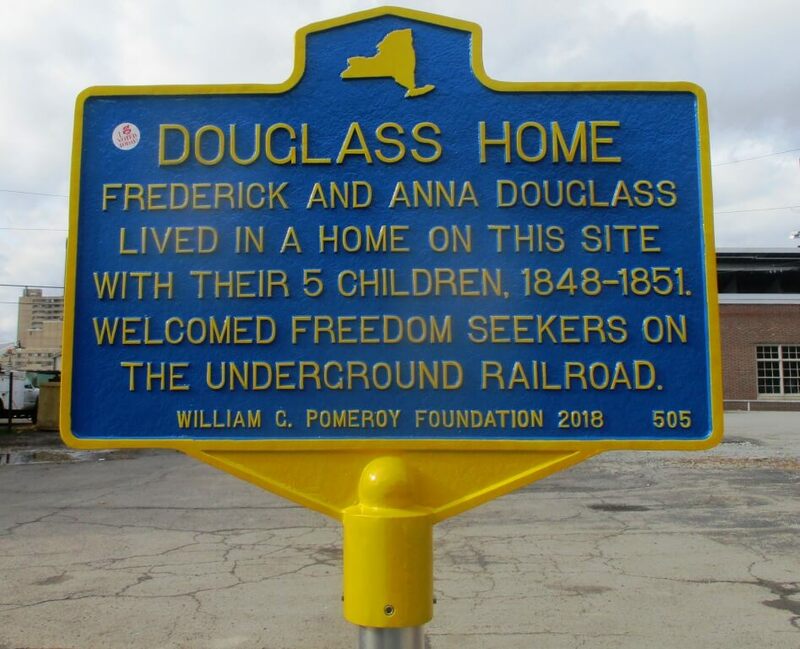 Frederick Douglass’ Alexander Street home commemorated; Seward Seminary marker still missing. Last week, Rochester celebrated an overdue event. As reported by WHAM13, Historic marker commemorates Frederick Douglass’ house in Rochester (11/05/18), a new plaque on the former site of Frederick Douglass’ first Rochester home is now installed outside a parking lot on 297 Alexander Street. 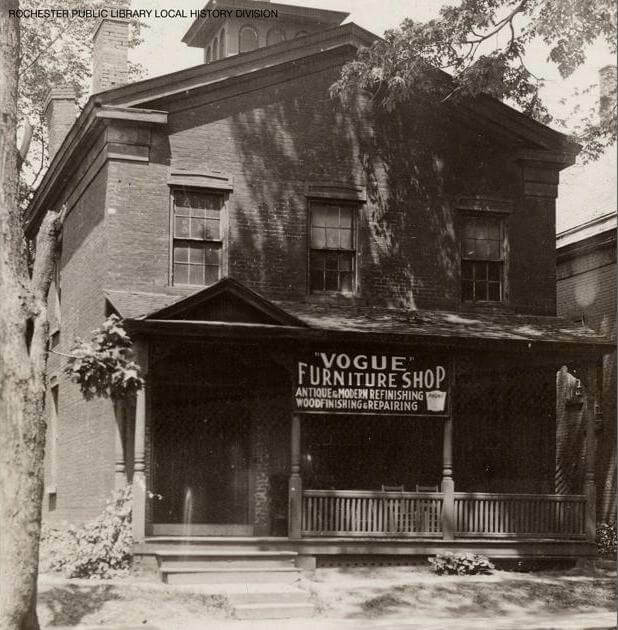 Douglass purchased the home in 1848 for $1000. The Douglass family later moved to a larger homestead on South Avenue, now the site of the Anna Murray-Douglas Academy School #12. 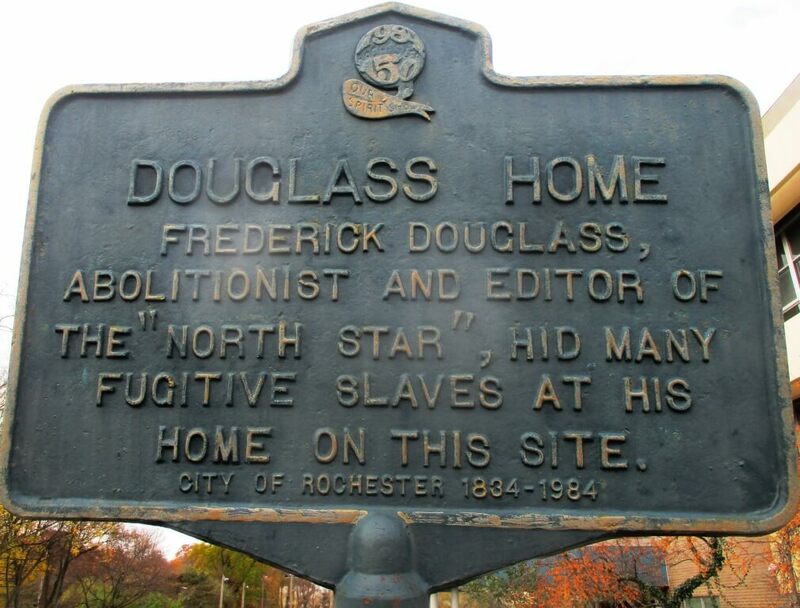 When preparing a recent article on Douglass, “The greatest American of the nineteenth century”, I recalled seeing a historical marker on the former site of the Seward Seminary on Alexander near the old Genesee Hosiptal. 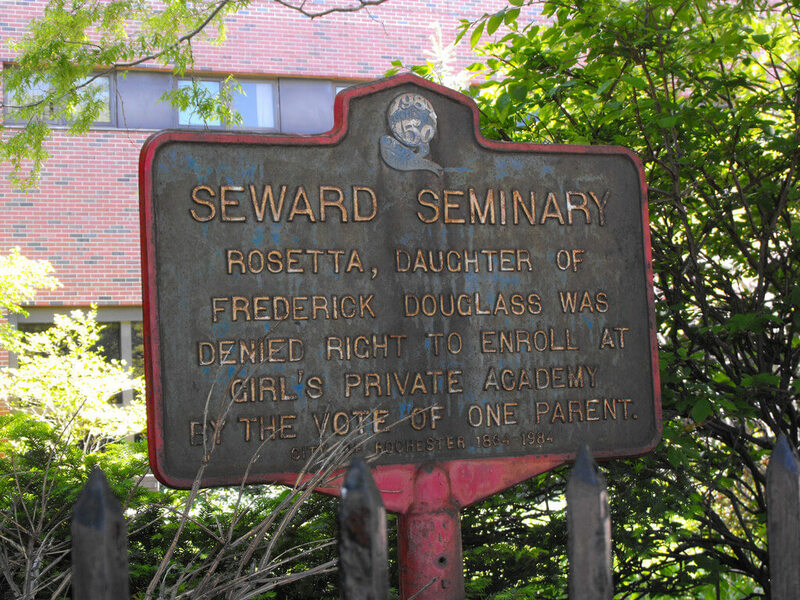 The marker described how Douglass’ daughter, Rosetta, was not allowed to sit with white students at the private academy. At the time Rochester’s public schools were segregated. Lisa Dossenbach Kleman sent this 2013 photo. Lisa says the plaque was gone by early 2015. In January of 2017, Lisa posted photos of the marker on facebook, asking if anyone knew its whereabouts. The photos generated lengthy discussion with lots of comments, but no one knew. 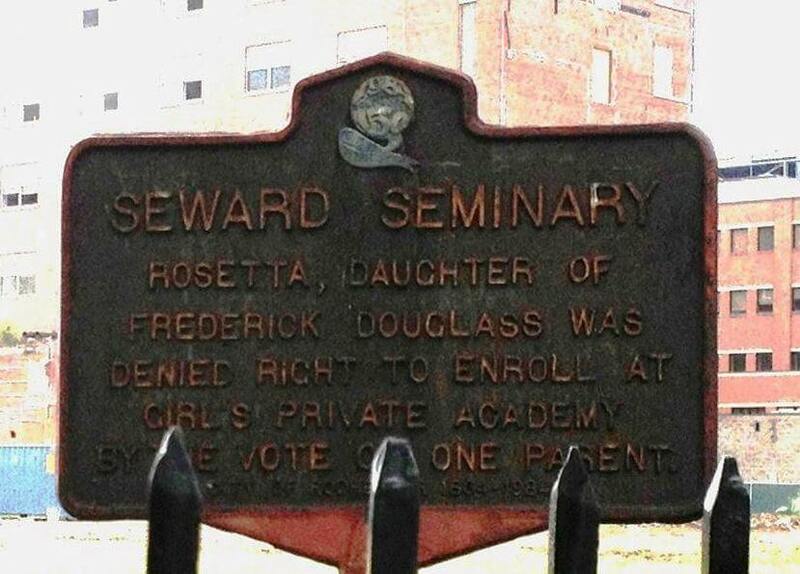 Shortly after moving into the first of his three homes, Douglass sent his daughter Rosetta to the nearby Seward Seminary. The principal, Lucilia Tracy, admitted her, but placed her in a class by herself due to disapproval by the school’s board of trustees. After protests from Douglass, Miss Tracy sent the white children home with notes to their parents, seeking their views on accepting Rosetta as a pupil. Due to the opposition of one parent — Horatio Gates Warner, editor of the Rochester Courier newspaper and designer of the Warner Castle on Mt. Hope Avenue — Douglass was forced to withdraw his daughter from the school. 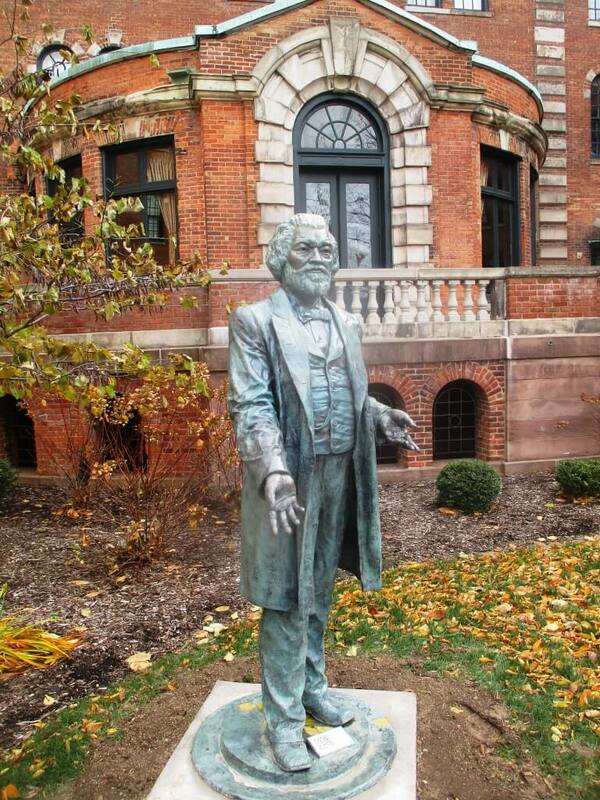 He later took part in a campaign to desegregate Rochester schools, a goal that was achieved statewide in 1857. An outspoken pro-slavery advocate, Horatio Gates Warner disliked that from atop his Warner Castle he could see the Douglas homestead on South Avenue. But when I went to the site on Alexander/Tracy, the marker was no where to be seen! Puzzled, I asked Emily at the Local History Division what happened. In an odd coincidence, at that very moment Emily was reading David W Blight’s recent biography of Douglass, Frederick Douglass: Prophet of Freedom (2018), that was the basis for my article, “The greatest American of the nineteenth century”. Emily explained that when the hospital expanded, the marker was removed. Apparently, no one is sure where the plaque is stored. The Office of the City Historian is searching but the whereabouts of the marker are still unknown. I did wonder if I was the only person who inquired — or cared that much — about the marker. Emily said, believe it or not, several people have asked Local History about the fate of the plaque, reassuring me I was not alone as an eccentric history buff.